Which Project is your Favorite? Vote Now! Developers who use tools from Qualcomm Technologies, Inc. (QTI) include our customers and OEMS as well as “makers”, students and hobbyists. And even teams within QTI! To showcase these talents, Qualcomm Developer Network (QDN) launched our Project Page about two years ago, and we’re proud to announce that we’ve recently posted our 100th project! While we love all of the projects, we’re acknowledging this milestone by highlighting the top five projects which have exhibited exceptionally noteworthy features. So, have a read through, and when you’re done, be sure to vote for your favorite! When you think of wearables, smart watches are probably the first thing that comes to mind. But at the FIRST Robotics Competition in 2017, QTI showcased a Robot Dress based on a smart crinoline. A crinoline is a structured undergarment designed to hold and shape a dress. Our team took the traditional crinoline to the next level by implementing it as a robotic structure to add shape and movement to a stage costume. This redefined the term “wearable” and sought to inspire a new generation of engineers through non-traditional applications for engineering. 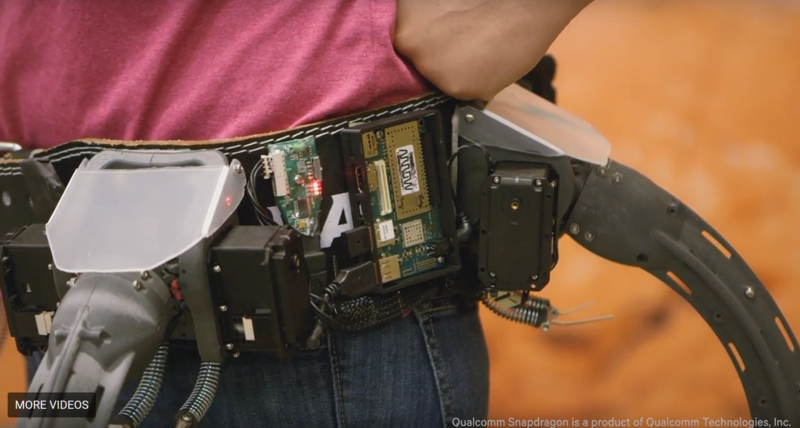 The robotic crinoline is composed of 3D-printed parts articulated by servos, and controlled by a DragonBoard™ 410c – a development board by Arrow Electronics - for developing Qualcomm® Snapdragon™ 400-series devices and applications. This board controls the dress and allows the crinoline to change shape as the actress performs. The project has certainly made us rethink what can be wearable and clearly shows new and creative applications for engineering. With cameras in almost all mobile devices today, have you ever wondered how many times you’ve appeared in other people’s pictures and videos, or considered the effect on your privacy? During our Intern Hack Mobile 2018, a small group of QTI interns took it upon themselves to solve this issue using TensorFlow, OpenCV4Android, and the Qualcomm® Neural Processing SDK. The result was FaceBlock, an Android application that uses visual intelligence to automatically identify and hide faces captured on camera. With FaceBlock, facial recognition is designed to be performed in real time and emojis are superimposed over faces, like augmented reality objects. Facial recognition involved training a MobileNet V1 TensorFlow model using the WIDER facial dataset, while facial tracking is accomplished using OpenCV4Android. 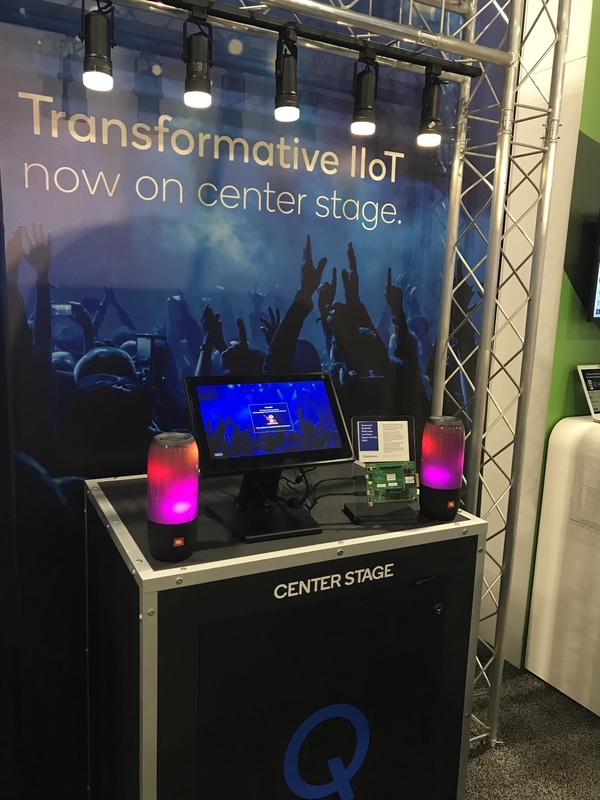 IoT takes center stage in the GlobalEdge Software (GES) Center Stage Light Show project, that demonstrates the use of the QCA4020 development board at a music concert. A smart gateway equipped with the QCA4020 is installed at center stage and uses data from a PIR sensor to measure crowd movement. Based on the data collected, the smart gateway controls the colors of Bluetooth Low Energy (BLE)-powered light bulbs to create an atmosphere that directly reflects crowd engagement. The smart gateway also interfaces with a DragonBoard 410c, which runs a node.js web application to notify event organizers when crowd engagement drops. It also provides a screen showing metrics about music interactions and data received from the PIR sensor. Using this configuration, event organizers not only gain insight into crowd engagement, but can use the information to help influence that engagement. For example, based on measurements of the crowd’s activity, show organizers can vary the music being played. More generally, the project shows how IoT technology can bring intelligence to live entertainment and make it more dynamic and interactive. IoT devices are being used to gain insight into merchandise sales within stores, but how do you accomplish this when your merchandise is distributed across a wider area? To answer this, GES put together their LTE for IoT Merchandise Cart project. This project simulates merchandise carts stocked with products that have been distributed across the grounds of a music festival. A mat with force sensors detects the presence/absence of physical merchandise on a cart, and reports this information through connections to a DragonBoard 410c. 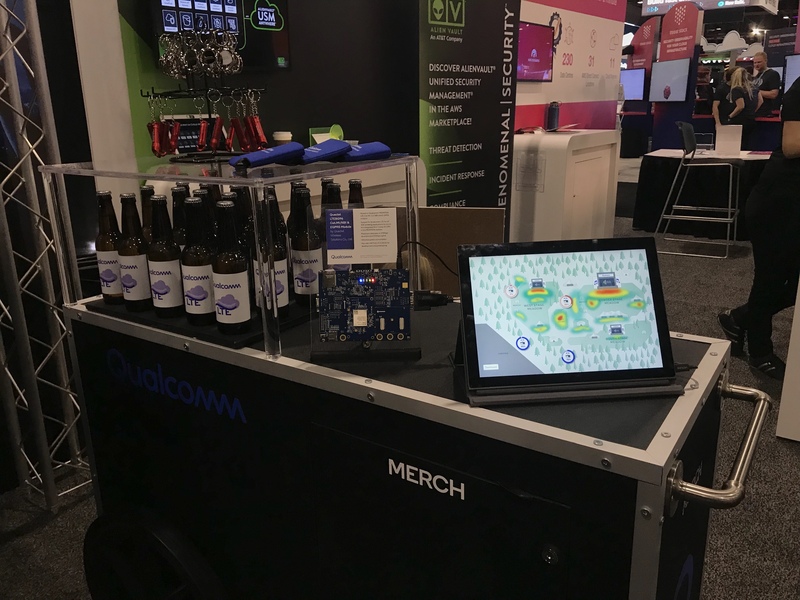 The DragonBoard 410c is connected to a Quectel LTE OPEN EVB equipped with a Qualcomm® MDM9206 LTE modem, over which data is sent to an AWS IoT cloud service. Using the QTI LTE for IoT SDK, the system can track merchandise carts and sync the inventory levels to an AWS IoT instance over LTE. The AWS instance running the dashboard application gives the users and event organizers the ability to simulate the action of re-deploying the vendor carts by dragging and dropping icons across a map. With the goal of trying to maximize sales, these components can support a virtually always-on, always-connected services that provide near ubiquitous reach spanning both outdoor and indoor locations. Moreover, real-time data collection allows merchants to make decisions about cart placement and top selling products, so they can help to influence sales. So far, we have seen how makers (Robot Dress), internal teams at QTI (FaceBlock) and IoT solution developers like GES (Center Stage and LTE Merch Cart) have used tools and development platforms from QTI to create interesting projects. This final project is a very good example of how we are helping university students bring their ideas to life. A team of students at University of Wisconsin Madison created this project for their ECE 453 Embedded Capstone course. They turned to the DragonBoard 410c as they needed a platform with an embedded GPU and voice recognition capabilities. They built a small, 3D-printed house with an LCD screen, and a multimedia app with an interactive character named Mr. Truman. The house features a microphone through which users can give voice commands to Mr. Truman for on-screen actions, a gyroscope that detects tilts and moves the character, a servo that exposes speakers to play sound from an audio source, and LED lights the app can turn on or off as instructed. These components are tied together by a DragonBoard 410c, which runs the application, interacts with the devices, handles voice recognition, and provides the necessary rendering capabilities. A short demo of the project is available on YouTube. Picking the top five projects was no easy task because all of the projects we received are great. These projects have shown there is a diverse developer community at QDN, spanning multiple skill levels and areas of focus. And behind you are the ever expanding diverse solutions based on QTI technologies that currently span across four hardware platforms including the Snapdragon series, five operating systems, and six cloud services. We hope this blog inspires your next project, and we would love to hear about the projects that you have put together. Once you have a project you want to share, be sure to submit your project to be featured on our Project Page.